On this DVD, Grandmaster Roman Dzinzichashvili has gathered some of the best games played with his original opening ideas and concepts. This will update you in the latest chess theory, including great tactics generated by novelties AND AMAZING ENDGAMES. Roman will also bring you a brief analysis of current developments played on the highest level. This Vol. 100 is a collection of some of the best chess material Roman has brought you over the last 2 decades. 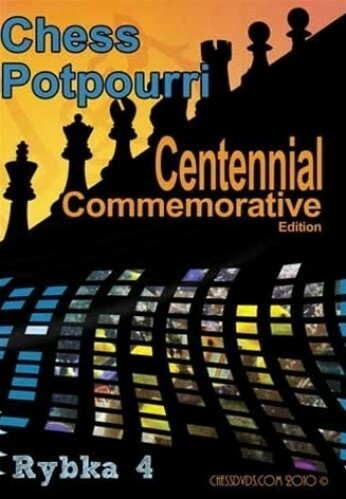 VOLUME 100 - Chess Potpourri - Centennial Commemorative Edition Grandmaster Roman Dzinzichashvili 136 Minutes On this DVD, Grandmaster Roman Dzinzichashvili has gathered some of the best games played with his original opening ideas and concepts. This will update you in the latest chess theory, including great tactics generated by novelties AND AMAZING ENDGAMES. Roman will also bring you a brief analysis of current developments played on the highest level. This Vol. 100 is a collection of some of the best chess material Roman has brought you over the last 2 decades.